Coordination languages simplify design and development of concurrent systems. 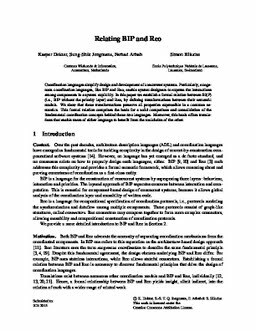 Particularly, exogenous coordination languages, like BIP and Reo, enable system designers to express the interactions among components in a system explicitly. In this paper we establish a formal relation between BI(P) (i.e., BIP without the priority layer) and Reo, by defining transformations between their semantic models. We show that these transformations preserve all properties expressible in a common semantics. This formal relation comprises the basis for a solid comparison and consolidation of the fundamental coordination concepts behind these two languages. Moreover, this basis offers translations that enable users of either language to benefit from the toolchains of the other. Dokter, K.P.C, Jongmans, S.-S.T.Q, Arbab, F, & Bliudze, S. (2015). Relating BIP and Reo. Formal methods [FM]. CWI.